The majority of the island's annual visitors come for one thing: the area's incomparable scuba diving & snorkeling. With over 30 kilometers of reefs, water visibility to 200 feet, and over 200 species of tropical fish, Cozumel is considered by many the finest dive destination in the Western Hemisphere. Water temperatures range from summer highs in the low 80's to winter highs in the low 70's (F.). More than 50 dive shops operate on the island offering advanced dives and beginner instruction. Much of the diving is "drift diving." The island also has a couple of hyperbaric chambers for safety. To reach ANOAAT call (987) 872-5955 or fax (987) 872-5966. Some of the popular sites in the area include Paraiso Reef, Chankaab Caves and Reef, Columbia Reef, San Francisco Reef, Santa Rosa Wall, Maracaibo Reef, and Plancar Reef (part of the second longest reef in the world). Chankanaab Bay: teeming with fish and calm, clear water; several lime stone caves and tunnels make for great fun. You can also swim with dolphin's at a marine park here. La Ceiba Bay: a sunken aircraft wreck lies 150 yards off shore in about 25 feet of water, home to a plethora of colorful fish, colorful fish, coral, and sponges. Playa San Francisco: calm water and close-to-shore undersea delights. This beach has full-service amenities (dining, equipment rentals). Full day snorkeling and half day snorkeling excursions can be easily arranged upon arrival, and often include equipment and lunch. For non-snorkelers there are glass-bottom boat trips are arranged at most resort hotels. The area's exceptional diving overshadows the island's excellent fishing. Billfish, including marlin and sailfish, are caught within .5 km. of shore (season: March through June). Dorado, bonita, barracuda, amberjack and wahoo are caught year around. Most excursions leave from the Club Abrigo Nautico de Cozumel, located north of town near the airport. 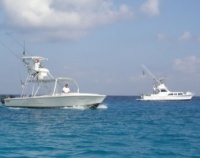 A popular billfish tournament comes to the island every May. Windsurfing, sailing , jetskiing and waterskiing are also popular on the island's western shore. Nearly all resorts have water sports rentals. Playa San Francisco offers the widest range of watersports equipment. Beyond the island's waterside activities, there's plenty to see and do away from the shore. Since only about 5% of Cozumel's terrritory has any development, exploration centers on natural attractions (beaches, lagoons, jungle-like forests), Mayan ruins, and the relaxed city of San Miguel. The island's Mayan ruins and beaches can be seen easily in a day. 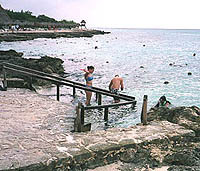 There are also some "must-see" attractions on the main-land across from Cozumel. 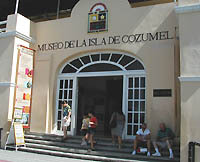 Some other land-based activities on the island include minature golf, tennis, scooter & mountain bike rentals, and exploring the Cozumel's fine museum. Cozumel's beaches vary from scalloped bays and inlets to wide wind-swept swathes of powdery sand. The calm waters of the western side of the island are ideal for swimming, snorkeling, windsurfing, and sunbathing. The desolate, eastern shore is lashed by waves and steady winds, although there are some lovely escarpments and bays safe for swimming. Playa San Juan: To the north of the Melia Mayan Hotel, this family favorite has plenty of shade, calm water, excellent windsurfing, and restaurants. Chankanaab Bay: This popular full-service beach invites divers and snorkelers to explore the area's limestone shoreline caves. This is the island's prime snorkeling turf; excellent facilities for swimmers and non-swimmers, include Chankanaab Lagoon and Botanical Gardens. Head to La Laguna restaurant for lunch. 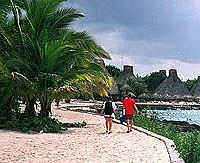 Playa San Francisco: Cozumel's best beach stretches 3.5 kms. along the island's southwestern shore. 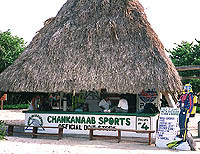 A favorite with locals and dive boats exploring the offshore reef, the beach has plenty of activity at several palapa restaurants and bars. Popular for lunch. Resort development is currently underway, changing the beach's idyllic character. Playa Chen Rio: Resting at the end of the trans-island road, this beach is protected by a wall of rocks, keeping the water calm. One of the Eastern shores best beaches. Very quiet and secluded.